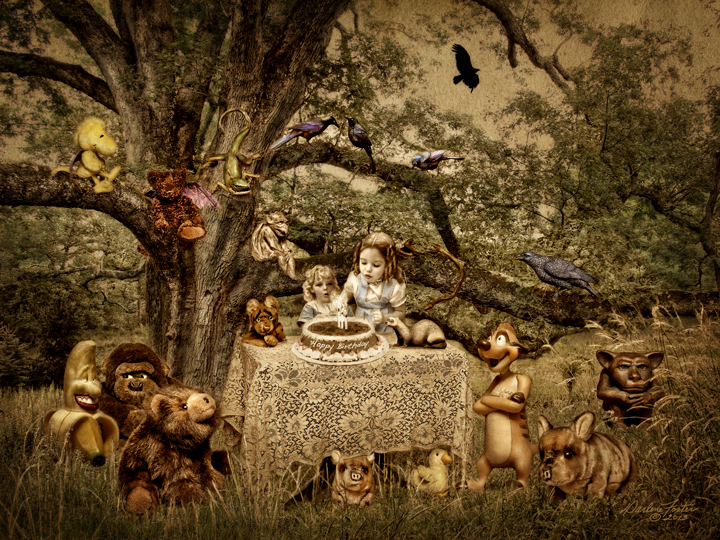 The Birthday Party ©2013 - This montage was created for RSI Bank's Annual Artist's Contest with a theme of "Celebration". When considering my entry for the show, none of my current work seemed to fit the theme so I came up with this slightly off beat version of a birthday celebration with a hint of the Alice in Wonderland tea party. "The Birthday Party" is comprised of 25 different photos, one of which is a vintage family photo of me blowing out the candles on my birthday cake as my friend watches from behind. The other "guests" all currently live in my house (with the exception of my backyard blackbirds and the hawk flying overhead). The base photo is an amazing 600 year old white oak tree located in the cemetery of the Presbyterian Church in Basking Ridge, NJ. All the historic headstones beneath the tree were incredible to walk through and read but unfortunately, didn't quite fit my composition so I added a field of grasses from another image instead and "The Birthday Party" came together. And lucky for me, it was accepted into the show! If you're in the area of Rahway, NJ, the opening reception for "Celebration" is Sunday, June 2 from 11 AM to 4 PM at RSI Bank, 1500 Irving St, Rahway, NJ. The show runs from June 2 thru June 29, 2013. Blue Bird ©2013 - I was in another still life mood recently and decided to start with one of my favorite tin boxes. I found it quite a few years ago in a local antique shop and bought it as a Christmas present for Tom. He has a love of warm island places so the palm tree motif fit right in with his collection of ukuleles (which are all over our house along with other related memorabilia). The bananas and wine might be a nice thing to have on hand if you were settling in to practice a few "Hits from Hawaii". 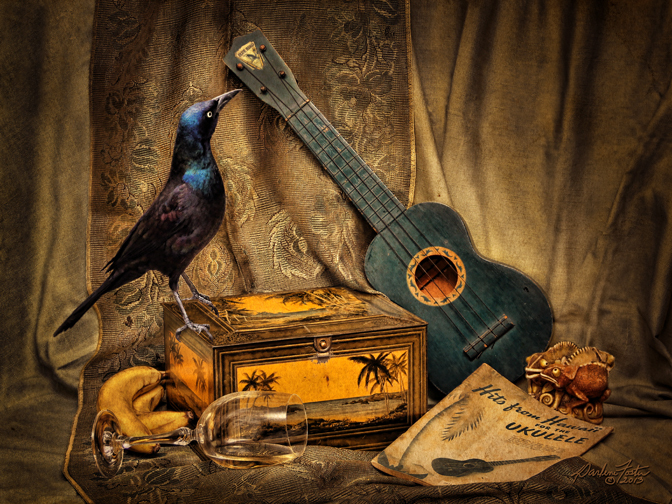 The chameleons, whispering among themselves, seem a little annoyed by the intruding bird who apparently tipped over the wine glass as he flew in to check out the "Blue Bird" ukulele.